Carl Frampton is adamant he’s not in the slightest bit concerned by the charm offensive from rival multi-weight world champion Nonito Donaire ahead of Saturday’s clash. Legendary Filipino Donaire (38-4-KO24) has sung, danced and coached his way into the affections of many Belfast locals but there was only one favourite at Friday’s weigh-in as ‘The Jackal’ revelled in home support. Of the visitor’s popularity, Frampton (24-1-KO14) said: “This is my city. I own it. I’m the king of Belfast. Donaire knows it as well. “He’s playing a clever game but I’ve done this before. He’s being overly-nice and then tomorrow night he’ll be growling and hope it surprises me – but that’s my game. “I’m the nice guy who gets the angry head on. You can’t bluff a bluffer. I know tomorrow night, he’ll be in there hoping to take my head off. ALEX DICKINSON 222lbs V LEE CARTER 268lbs. Canada’s preeminent destination for boxing fans in Canada, Super Channel, will air a world-class event featuring two world title fights this Saturday, headlined by the 12-round main event for the World Boxing Organization (WBO) Interim World Featherweight Championship between former world champions Carl “The Jackal” Frampton and Nonito “The Filipino Flash” Donaire, live from The SES Arena in Belfast, Northern Ireland, United Kingdom. Frampton vs. Donaire, presented by Frank Warren’s Queensbury Promotions, will air exclusively on Super Channel across Canada, starting at 2:30 p.m. ET / 11:30 a.m. PT. WBO World Bantamweight Champion Zolani “Last Born” Tete defends his title against former world champion and Olympian Omar “El Huracan” Andres Narvaez in the 12-round, co-featured event. 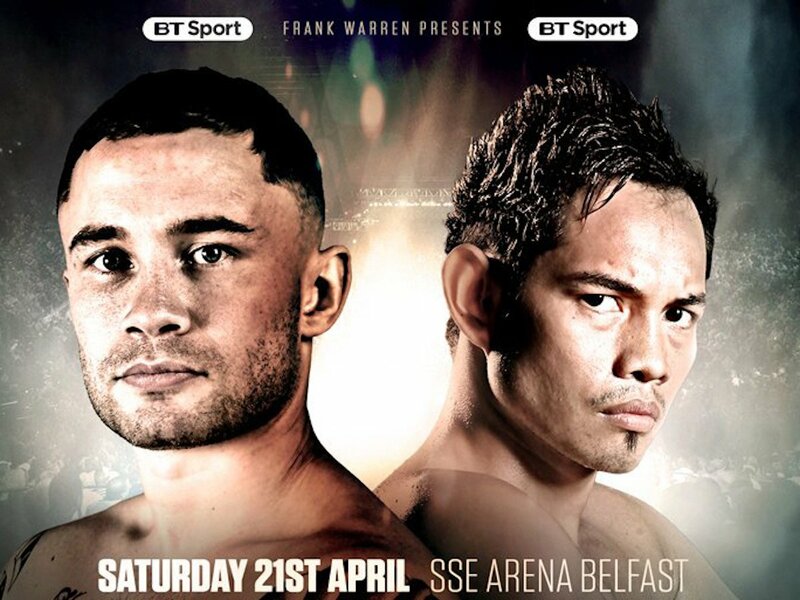 The 31-year-old Frampton (24-1, 14 KOs), fighting at home in Belfast, is a former World Boxing Association (WBA) Super World Featherweight Champion. The crowd-pleasing Irishman is 5-1 in world title fights, 6-1 (3 KOs) versus current or past world champions, including a victory over Canada’s Steve Molitor. Frampton has also defeated world champions such as Kiko Martinez (twice), Scott Quigg and Leo Santa Cruz, the reigning WBA featherweight world champion who defeated Frampton in their world-title fight rematch on January 28,2017 for the WBA crown. Philippines-native Donaire, who lives in San Leandro, California, is a seven-time, four-division world champion, who is 10-0 in fights held outside of the United States. The 35-year-old Donaire has a 13-3 (8 KOs) world title fight record and he’s 12-3 (8 KOs) against current or former world champions. His Who’s Who list of victims include Vic Darchinyan (twice), Ferrnando Montiel and Wilfredo Vasquez, Jr., among the more notables. One of the greatest Filipino fighters of all time — along with Manny “Pac Man” Pacquiao, Gerry Penalosa and Gabriel “Flash” Elorde –Donaire is unquestionably a future Hall of Famer, who has won five of his last six fights. Tete (26-3, 2 KOs), fighting out of South Africa, captured his WBO title a year ago, when he won a 12-round unanimous decision over Arthur Villanueva (30-1). Last November, Tete needed only 13 seconds to one-punch knockout his fellow countryman, Siboniso Gonya (11-1), In his first title defense. Narvaez (48-2-2, 25 KOs) is a two-time, two division world champion, as well as a two-time Argentinian Olympian. The veteran southpaw has an incredible 28-2-1 (12 KOs) record in world title fights during his 17 1/2 -year pro career. One of his two career losses, ironically, was in 2011 to Donaire by way of a 12-round unanimous decision for the WBO world bantamweight title. Other exciting fights on the “Frampton vs. Donaire” card, in addition to the aforementioned main event and co-feature, will air in Canada exclusively on Super Channel. Super Channel aired major boxing events live in 2017 like Brook vs. Spence Jr., Pacquiao-Horn, Eubank, Jr. vs. Abraham, Lomachenko vs.Marriaga, Crawford vs. Indongo, Smith vs. Williams II, and the World Boxing Super Series (WBSS) quarterfinals and semifinals. To watch Frampton vs. Donaire live, as well as more exciting boxing to come in 2018, fight fans in Canada can contact their local cable provider to subscribe to Super Channel and all that it offers, including premium series, movies and much more, for as low as $9.95 per month.